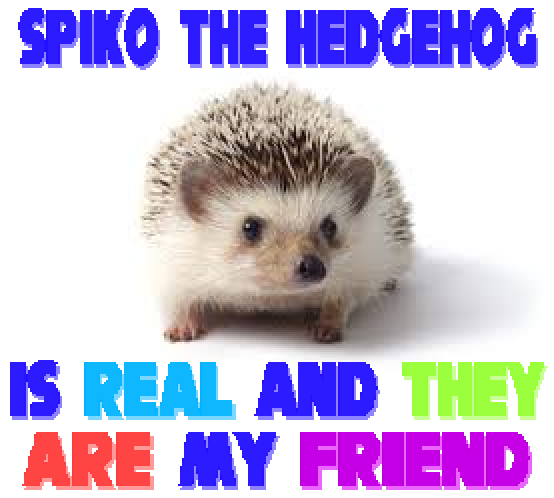 "Spiko The Hedgehog Is Real And They Are My Friend"
The title says it all, doesn't it? Well, not really, there's a lot more to be said to this story. That's why I made this autobiographical video game experience to document it all! You will witness what I saw and thought, become part of the emotional rollercoaster that is your own fictional character becoming real, becoming your friend, and becoming impatient because the game you're making for them is taking too long. What does Spiko want, what does Spiko need, to be happy? That's what this is about. That's what we're here to learn. Spiko is real, and they want to be recognized. Can you even become Spiko? No, only Spiko is Spiko. Sorry. 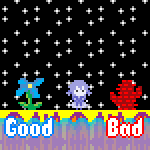 But you can pretend to be Spiko, and make them move around the screen sometimes. After the introduction, you can play by using the left and right arrow keys or A and D to move left and right, respectively. You can press the spacebar to jump. Thank you for taking part in this important step in my journey to understanding what it means to be a video game developer. As such, I've also included the source code for the game in the "source" folder for anybody to look into if they so wish. It requires Clickteam Fusion 2.5 to run. Detailed credits are available in "Credits.txt", in the download. Oh, and happy April Fools! This was a real april treat! Hahahahaha! That was pretty great! Loved the voice acting and then the utter chaos in the different stages. nyfb vs v unq zber gvzr ba guvf ncevy sbby v jbhyq rqvg znevb sna tnzrf tnynkl gb or fcvxb sna tnzrf ynaq be fbzrguvat ohg gurl punatrq gurve jrofvgr sbe ncevy sbbyf! znevb... jr jvyy qrsrng uvz sbe bapr, bar qnl! It's always a nice feeling to make games for your friends! I'm happy to have been introduced to spiko through the medium of this game! spiko says "I hope I can meet you too!". spiko is on my lap right now as they say this. they are poking me in the leg with a quill. ow. Very enlightening. I loved Spiko's voice acting. I also loved the bitcrushed sound of win.ogg, which I recognise as originating from COMPLET3.MID! Thank you! I had a lot of fun voicing Spiko haha. And that's a good ear on the music! That was a joy. I made so much happen. The pacing of the dialogue was great. thank you! the first draft of the script was like 2x as long haha. I feel like I've been learning how to write punchier dialogue!